For those born January 9, 1979. 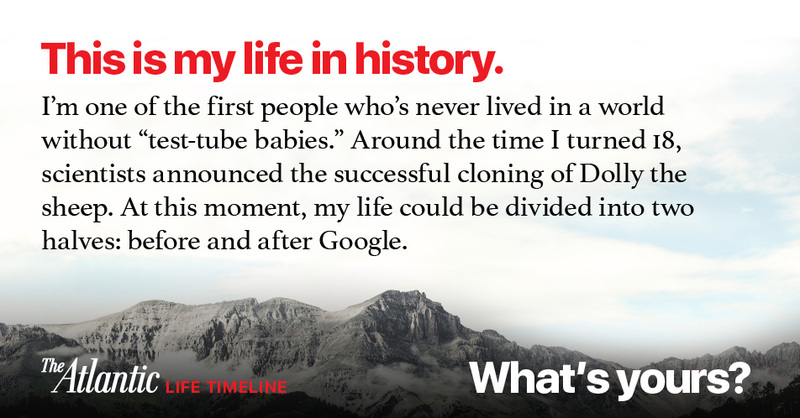 You're one of the first people who's never lived in a world without "test-tube babies." Around the time you were born, a joint effort was established between the United States and People's Republic of China to begin full diplomatic relations. In September 2013, Matt Schiavenza wrote about how relations between the United States and China have changed. You were born in January of 1979. This year, The Atlantic celebrates its 160th birthday, making it 4 times as old as you. The year you were born, James Fallows, who worked as a speech writer for President Jimmy Carter, wrote about why the latter's presidency had been so constrained. At 10 years old, you saw the collapse of the Berlin Wall. Buffy the Vampire Slayer was released in 1992. Around your 18th birthday, scientists announced the successful cloning of Dolly the sheep. In June 2002, Robert A. Weinberg wrote that cloning had detrimental effects on other areas of research. Your life can be divided into two halves: before and after Google. In the July/August 2008 issue, Nicholas Carr wondered whether Google was making people stupid. In 2002, Adam Levine, who was born the same year as you, released his first album, Songs About Jane, with his band Maroon 5, which earned them a Grammy Award for Best New Artist. In November 2013, Alexander Abad-Santos wrote about why Levine's being named Sexiest Man Alive is truly a success story. When you turned 31, you saw the rise of the Arab Spring. By the time you turn 46, experts at the Pew Research Center warn that there will be no "surveillance-free spaces."